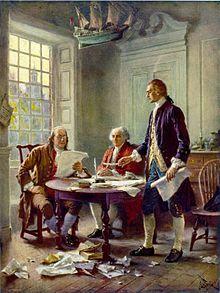 The Founding Fathers of the United States are those individuals of the Thirteen Colonies in North America who led the American Revolution against the authority of the British Crown in word and deed and contributed to the establishment of the United States of America as a new, independent country. I cannot contemplate their great deeds with less than admiration. They were statesmen, patriots and heroes, and for the good they did, and the principles they contended for, I will unite with you to honor their memory. In their admiration of liberty, they lost sight of all other interests. [Thomas] Jefferson spoke for all the most prominent members of the revolutionary generation in urging posterity not to accept their political prescriptions as sacred script. It is richly ironic that one of the few original intentions they all shared was opposition to any judicial doctrine of " original intent." To be sure, they all wished to be remembered, but they did not want to be embalmed. Joseph J. Ellis, from his book, The Quartet: Orchestrating the Second American Revolution, 1783-1789 (2015), page 220. Alfred A. Knopf. ISBN 978-0-385-35340-3. The achievements of women's rights movements, for instance, were real and important, but you cannot understand them if you do not first understand the founding fathers’ achievement in establishing a system of government based on the guarantee of rights. [T]hey were iron men, they fought for the principle that they were contending for; and we understood that by what they then did it has followed that the degree of prosperity that we now enjoy has come to us. [C]ommunities, by their representatives in old Independence Hall, said to the whole world of men: "We hold these truths to be self evident: that all men are created equal; that they are endowed by their Creator with certain unalienable rights; that among these are life, liberty and the pursuit of happiness." This was their majestic interpretation of the economy of the Universe. This was their lofty, and wise, and noble understanding of the justice of the Creator to His creatures. Yes, gentlemen, to all His creatures, to the whole great family of man. In their enlightened belief, nothing stamped with the Divine image and likeness was sent into the world to be trodden on, and degraded, and imbruted by its fellows. They grasped not only the whole race of man then living, but they reached forward and seized upon the farthest posterity. They erected a beacon to guide their children and their children's children, and the countless myriads who should inhabit the earth in other ages. Wise statesmen as they were, they knew the tendency of prosperity to breed tyrants, and so they established these great self-evident truths, that when in the distant future some man, some faction, some interest, should set up the doctrine that none but rich men, or none but white men, were entitled to life, liberty and the pursuit of happiness, their posterity might look up again to the Declaration of Independence and take courage to renew the battle which their fathers began, so that truth, and justice, and mercy, and all the humane and Christian virtues might not be extinguished. Abraham Lincoln, The Gettysburg Address, honoring U.S. soldiers at the dedication of the Soldiers National Cemetery at Gettysburg (19 November 1863), based on the signed "Bliss Copy"
Being good gentlemen of the Enlightenment, the Founders thought that the demise of slavery would come about naturally. Washington, John Adams, Thomas Jefferson, all believed that somehow slavery would disappear. All the leading Founders affirmed on many occasions that blacks are created equal to whites and that slavery is wrong.